This Caramel Blueberry Pie Milkshake is filled with sweet vanilla bean ice cream, rich caramel, and Dark Chocolate Blueberries from Brookside. It’s creamy, delicious, and the perfect frozen treat to satisfy your ice cream cravings! It’s time to shake it off and cool down with a milkshake on this Monday, friends. And yes, I’m referencing a Taylor Swift song. Not sure what’s wrong with me, as I don’t care for her (no offense to those who do), but for some reason, her songs always get stuck in my head. Thus, the reason for singing this song while writing this post. After all, we are talking about shakes…milkshakes, that is! If I haven’t lost you yet, please keep reading. I promise I have a yummy recipe to share with you today. I don’t make milkshakes all that often, but when I do, I load them up with lots of ice cream and lots of delicious ingredients. Because they’re so easy to customize and take just minutes to make, milkshakes seem to be the perfect ice cream treat, especially during the summer. When I was shopping at Target last week, I stumbled upon Brookside chocolates in the candy aisle. This happens to be one of my favorite kinds of chocolate, so I couldn’t resist checking out their newest flavors. After careful consideration, I decided to try Brookside’s new Summer Berry Crisp Family Bar and their Whole Blueberries in Smooth Dark Chocolate. These goodies are exclusively available at Target, which is perfect for me since I shop there weekly. Once I got home, I couldn’t wait to test out the Brookside chocolates. Filled with wholesome ingredients and a delicious taste, these chocolate are definitely a new favorite of mine. So it was only natural that I take my love for Brookside and ice cream and create a delectable summer treat. This Caramel Blueberry Pie Milkshake is filled with sweet vanilla bean ice cream, rich caramel, and Dark Chocolate Blueberries from Brookside. It’s creamy, delicious, and the perfect frozen treat to satisfy your ice cream cravings. And if you’re anything like me, milkshakes are needed after a long day in the sun. This Caramel Blueberry Pie Milkshake combines hints of caramel and blueberries that create the perfect flavor combination. The Dark Chocolate Blueberries provide a subtle blueberry flavor, along with rich bursts of chocolate. And to add the pie crust flavor, graham crackers are sprinkled on top right before serving. 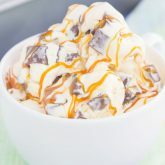 It’s the perfect complement to the vanilla and caramel flavors. 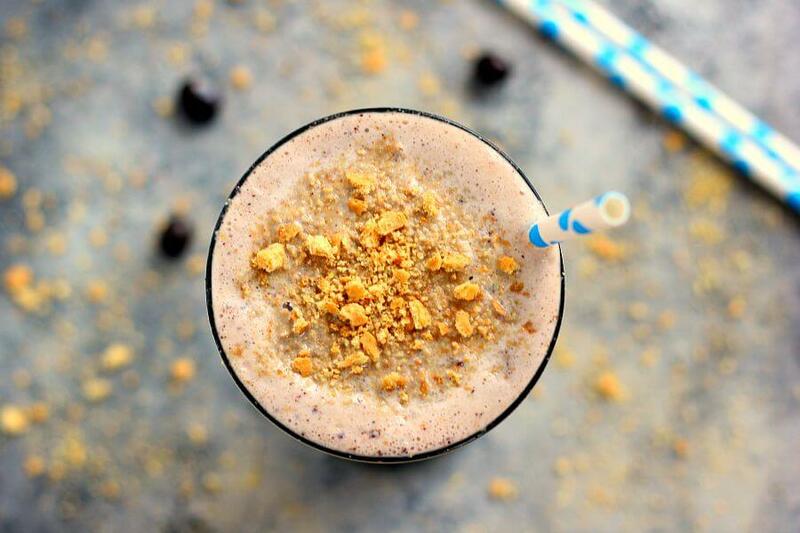 And because this Caramel Blueberry Pie Milkshake is a breeze to whip up. you can have this prepped and poured within five minutes. So that means less time in the kitchen and more time enjoying this mouthwatering treat! So the next time you’re at Target, be sure to check out your Cartwheel app for an upcoming Brookside chocolate offers! And while you’re at it, you can pick up the rest of the ingredients to make this decadent Caramel Blueberry Pie Milkshake! Looking for more frozen treats? I’ve got you covered! This Caramel Blueberry Milkshake is filled with sweet vanilla bean ice cream, rich caramel, and Dark Chocolate Blueberries from BROOKSIDE. 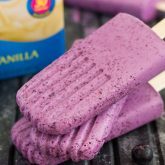 It's creamy, delicious, and the perfect frozen treat to satisfy your ice cream cravings! 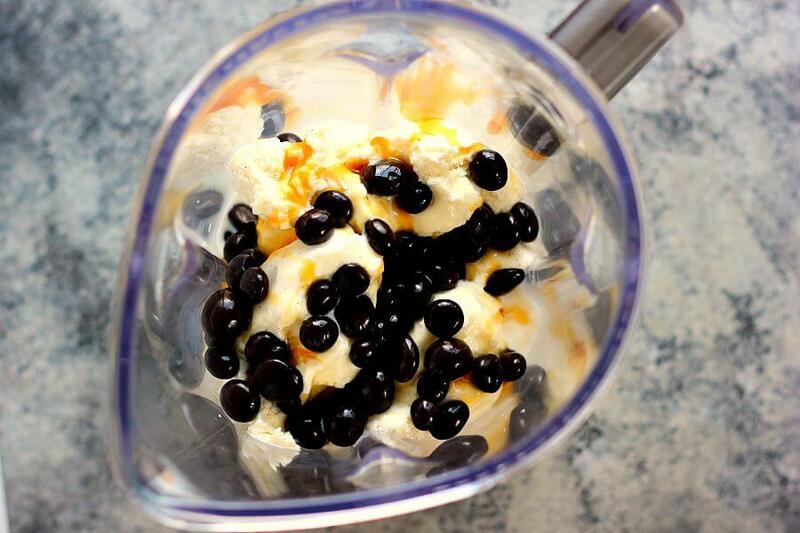 In the canister of a blender, combine the ice cream, milk, caramel syrup, and BROOKSIDE Dark Chocolate Blueberries. Pour into two tall glass, top with crushed graham crackers, and serve immediately. Like what you see? 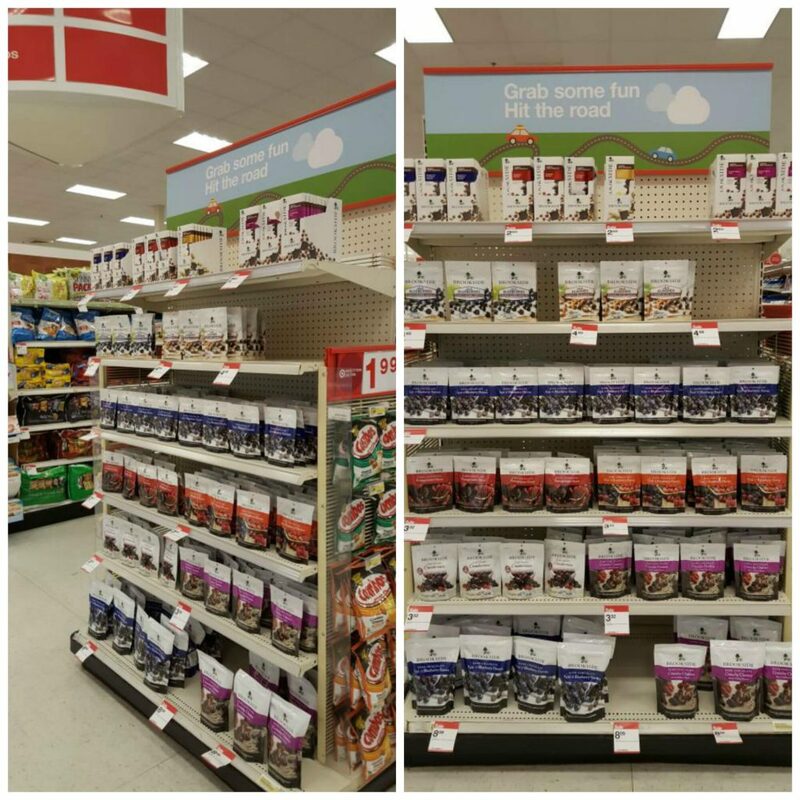 Then be sure to head over to Target to check out the new Brookside chocolates. You can also find Brookside on Facebook. Oh, how I love Target. And milkshakes. Taylor Swift, not so much. But her songs are definitely catchy, and she speaks to younger girls. So I'm cool with it! And I'm more than cool with this shake. Looks great! This milkshake looks so refreshing and delicious, Gayle! Love going to Target to find treats! Those chocolate covered blueberries sound awesome! Such a great idea to add them to this milkshake! Thank you, Kelly! 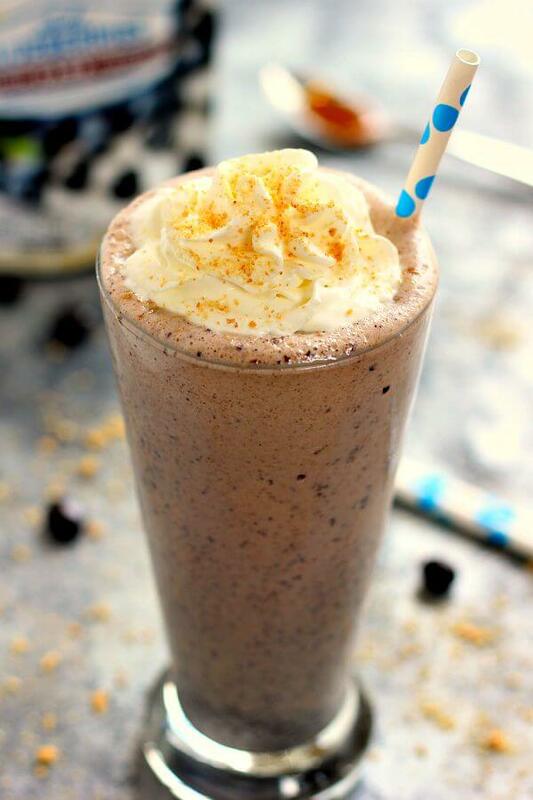 The blueberries give this shake a fun twist! I don't make milkshakes all that often either, but I just can't resist in the summer! Blueberries in dark chocolate? You guys just have the best products. I think I am going to spend SO much money in supermarkets buying things that we can't get here in the UK. This milkshake sure would make Monday a lot better. I think you will love loading up on new products when you visit, Dannii! Thanks for the kind words! Oh my gosh I LOVE Brookside chocolate covered blueberries! And what a fun way to use them - so creative to put them into a milkshake!! Thank you, Chelsea! It's the perfect addition to any milkshake! It's definitely ok with me to have this shake for breakfast! Thanks for the kind words, Sarah! Gayle, haha, I don't care for T Swift much either . . but you can't deny this girl's popularity. . it's crazy!!! ok, I so need a milkshake today!!! 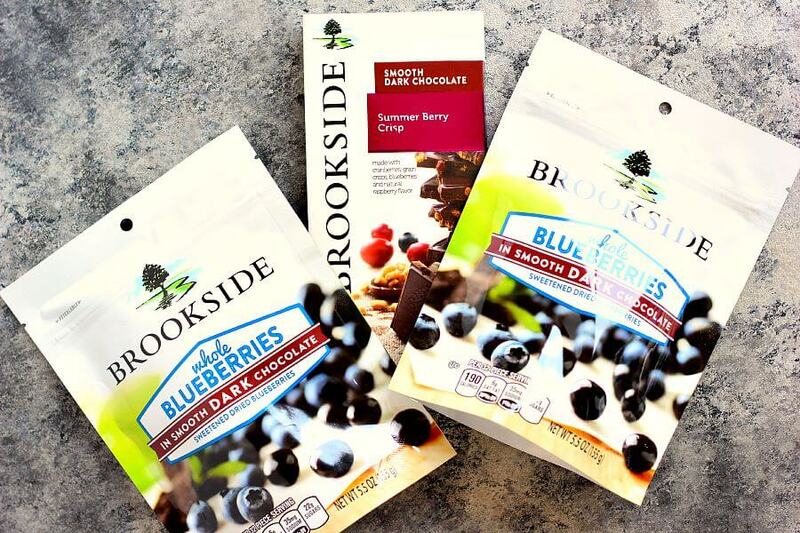 love this and can't wait to try the BROOKSIDE Dark Chocolate Blueberries!!!! yum! It is crazy, Alice! :) Thanks for the milkshake love! What an amazing milkshake Gayle! I love the sound of those dark chocolate blueberries, and what a great idea to add them into this delicious creation! It sounds so heavenly! Thanks, Harriet! The dark chocolate blueberries and caramel make the best combination! Taylor's songs get stuck in my head too and I hate it! I love Brookside's -- using them in a milkshake is a great idea. This looks absolutely delicious! Ugh why do her songs have to be so catchy? :) Thank you for the milkshake love, Marcie! This is a great way to start the week, Gayle! I'm not sure those blueberries would make it into the shake though. I can easily devour a bag! But I'm loving the sound of this shake!! It was so hard to not eat all of these blueberries, Jen! Thanks for the kind words! Let's shake it and make it, having here a Monday dance, since this smoothie looks oh so good! Thanks, Katalina! I love your Monday dance jingle! Oh man... this post makes me miss good ole Tar-Jay like crazy! The closest one to me now is like an hour and 1/2 away. *Tears* Now I totally need something creamy and decadent to turn my frown upside down! Soooo, thank you for posting exactly that! :) This milkshake sounds crazy good! 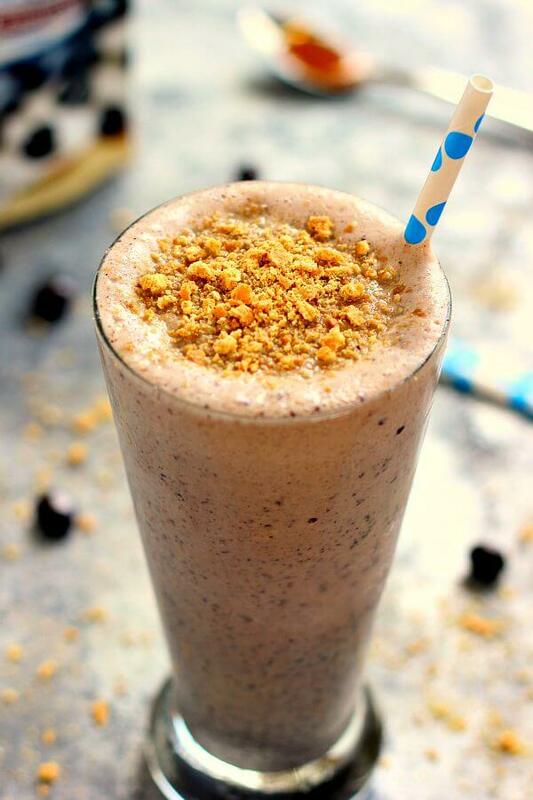 Caramel AND Blueberry Pie collide in a milkshake? Whaa? Yes!!! You are always so clever! I love this idea, Gayle! Thanks for always providing the deliciousness! <3 Cheers, girlfriend! My boyfriend LOVES milkshakes, although I could never seem to get onboard! Maybe i'll be a convert with this recipe. Hope you like it if you try, Dani! I love this milkshake Gayle, the dark chocolate blueberries sound so delicious! Pinned! Thank you, Manali! Ice cream and chocolate blueberries make the best combo! This is so creative Gayle! Your drinks are always beautiful! Love the idea of milkshake with chocolate covered blueberries! Thanks, Mira! This is one tasty milkshake that I've been making over and over again! Thank goodness it's still summer and I have a good excuse to keep making milkshakes! This beauty sounds incredible! Love that combination of flavors! 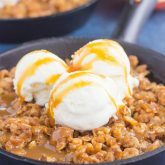 Gayle, I am so jealous that you get to go to target weekly.. our closest one is 45 mins away =( I would have never thought to pair caramel and blueberries, but this looks awesome! Thanks for sharing. I'm not a big T Swift fan either, but her songs are so darn catchy!! I am a big fan of your milkshake though!! It looks so good, and I could really use one right about now! Yes her songs are way too catchy for me! Thanks for the milkshake love, Cate! I love Brookside chocolates and I love the way you incorporated them into this recipe! Thank you, Medha! This drinkable pie is SO delish! 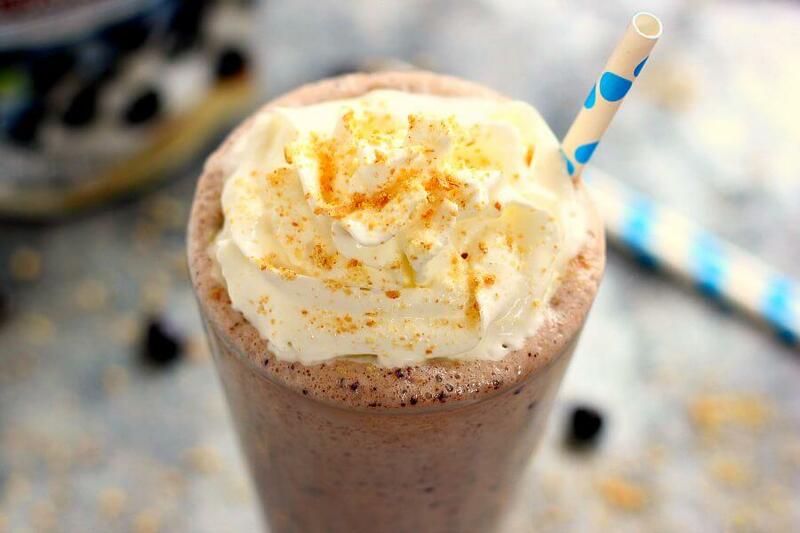 Caramel blueberry pie shake! !Ok I need this like now because this has everything I love in it!Such a genius drink Gayle!! This milkshake sounds fantastic Gayle! Love the dark chocolate covered blueberries! Thank you, Kelley! 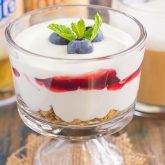 The blueberries add the perfect touch! This looks so good, Gayle! This flavor combination sounds wonderful. I don't think I've had caramel together and it sounds amazing! I can never turn down a milkshake - even if I'm going to have to shake shake shake it off! Thanks, Rachel! Caramel and chocolate blueberries are a delicious combo! A Summer Berry Crisp Chocolate BAR?! I need! This looks amazing Gayle! I love Brookside chocolates! The chocolate covered raspberry ones are my favorite! But the blueberries are definitely a close second. I love the milkshake idea! I could totally shake off the heat with this. Thanks, Michelle! Brookside chocolates are dangerously addictive! And I love the raspberries ones, too! This is such a great idea Gayle! I love those chocolate-covered blueberries - I bet they give such a great flavor to this milkshake! Thanks, Alyssa! I love the touch of flavor the blueberries give to this shake! I love brookside chocolates, those are the best! I never would have thought to put them in a milkshake though, that's such a great idea. I'm sure it's delicious! Thanks, Stacey! The blueberries gives this shake such a pretty color and flavor! I will take two of these for breakfast anytime!!! This would definitely make a great breakfast, Zainab! It has been a long time since I've made a milkshake, and this looks so rich and creamy. Yum! So creative! Thanks for the kind words and for stopping by, Amanda! Yes please!! Can you send one of these my way!? Thanks so much for the kind words and for stopping by, David! YUM! I love the combination of flavors you've got going on here, Gayle! Nothing like a milkshake! What an awesome milkshake here Gayle! Caramel and blueberry sounds like an awesome combo! Ack now Taylor Swift is stuck in my head ;) That's OK, I secretly kind of like that song! I've always wanted to try those chocolate covered blueberries, but would never have thought to put them in a milkshake...so creative! Looks delicious! I kinda secretly like that song, too! Thanks for the milkshake love, Denise! I only like my milkshakes totally loaded!! Love this one!! Thanks for the milkshake love, Michelle! Oh man I can never resist a good milkshake and this one looks amazing! I love target and they always have some good finds. These chocolate covered blueberries look amazing. I need to head over to tart asap! Pinned! Thanks for the kind words and pin, friend! Brookside berries are one of my favorites. You made them irresistible in this milkshake, Gayle! Loving it. What an interesting combination of flavors for a milkshake! Sounds so good! Thank you, Christin! It's one of my favorites!